Porsche had a good weekend. Between beating an incredible lap record which has stood for 3 and a half decades and getting a hard-won podium position, Porsche's motorsports endeavors are turning great results. On Friday, Porsche sent a shockwave through the motorsports world by breaking the lap record at the Nurburgring. The famous track in Nurburg, Germany, is among the most intense and demanding tracks in the world. The new record has been set on the Nordschleife circuit, a near-13 mile stretch of asphalt which combines 154 turns. The track is known for being singularly challenging, and sections of the track are known as "widow-makers." The amazing feat is more than just a new achievement, it's a defense of the company's existing place as record holder. In 1983, Stefan Bellof piloted a Porsche 956 to a searingly fast 6:11.13. This record has held since, which makes it among the oldest lap records in the world. Until Timo Bernhard beat the record by nearly a minute. Bernhard's driving is incredible. You can watch footage from within the car here. On the long straight of the track, which makes up part of the last portion of the circuit, Bernhard reached an astonishing 228mph, and stayed there as the engine rested on the limiter down the long straightaway. The record setting lap was allegedly the last attempt which the Porsche teams was going to make at setting the best time. This momentous achievement was paired with a well-earned podium for Porsche's #911 RSR GLTM car at IMSA's WeatherTech SportsCar Championship race at Watkins Glen. The race is the fifth round of the championship, and while Ford's class victory brought their team to the points leading position, the Porsche team, despite fierce competition, managed to take third and fourth, giving them the second points position. The team fought hard against near 100 degree heat, with the cars reaching up to 30 degrees higher still. In his final stint, Patrick Pilet, who piloted Porsche 911 RSR during the race, stated that his drinking-water delivery system broke. The team certainly had high hopes going into the weekend. Halfway through the race, the team had a first and second position lead, but during a yellow-flag event, their strategy was shaken when the pit-lane closed. This setback put the two cars in fourth and sixth. The team's climb to third and fourth took place within the last hour of racing, and made for impressive watching. Porsche dropped one position in points, but the season is far from over, and the team is hopeful about the upcoming round at the Canadian Tire Motorsports Park on July 8. 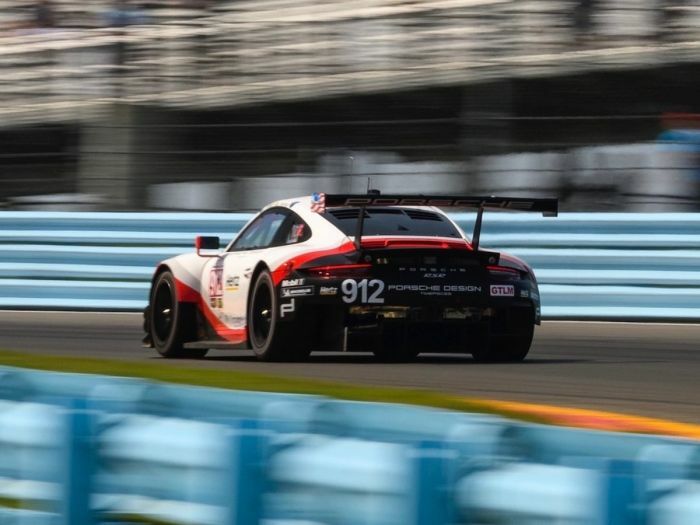 Porsche still has a new record to celebrate, and a well-driven, if difficult, race in upstate New York.